Our province has so many stories to tell; historic, impactful stories that show the diversity, pride, quirkiness and impact of British Columbia’s people, places and historical events. To share those stories, we’re refreshing and rejuvenating the BC Stop of Interest signs…and we need your help. We’re looking to take this on in two ways; first, to renew some of our older signs, and second, to create new ones that reflect the local stories and cultures that are part of British Columbia. Why the Refresh and Why Now? We did an inventory and a review of the 139 existing signs last year (fall of 2015) and found 75 per cent of them either require repairs or reinstallation. In some cases, they need to be replaced because the language is out of date. Really, really out of date. So we’ll work to update these signs and start replacing them this fall. We’re also asking you to provide your suggestions for about 75 new signs, sharing your local stories that mark a special place in BC’s history. It’s a great way to demonstrate our provincial pride, to enrich the trip for travellers, and show off BC as a premier tourism destination and great place to do business. Visit the website and nominate places, events or people that you think could be showcased. (In the case of people, they must have been deceased for 30 years). Give us the essentials — the who, what, when, where and why of the story. Attaching scanned photos or other supporting documents will also help us review your suggestion. We’re accepting submissions from Sept. 26, 2016, to Jan. 31, 2017, to make sure you have your say in that time. Completion of the online form explaining your reason for the nomination. The impact the person, place or event has had on the lives of British Columbians. What makes this an interesting stop of interest — any extraordinary circumstances or challenges the person, place or event has faced. If it’s an individual, they must have been deceased more than 30 years. How it’s of outstanding interest to the travelling public, both tourists and British Columbians. A consideration that new signs are evenly distributed around the province, between all regions. 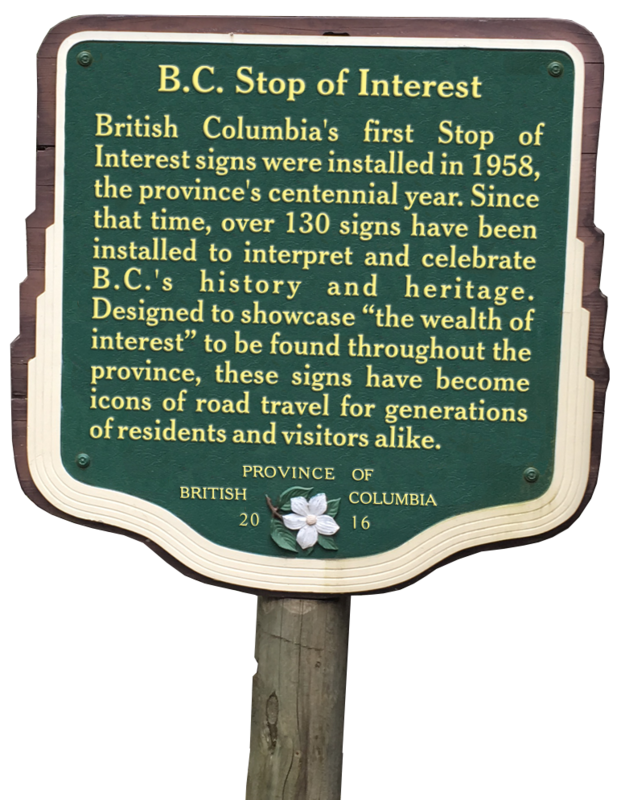 The Stop of Interest signage program was introduced in 1958, to commemorate the Colony of BC’s centenary and recognize significant historical places, people and events. More than 100 signs were erected from the 1950s through the 1990s. Click for a map listing Stops of Interest signs. We’re really looking forward to hearing your suggestions and to your help to kickstart this program, and show off why BC is such a colourful place to live and visit. Are you looking for reports of POI signs not listed in your inventory? Thanks for the spreadsheet listing BC Stop of Interest signs. It closely resembles an inventory we did some time ago, when we first put out the call to the public, to suggest new signs. In all, we received more than 500 submissions for new signs between September 26, 2016 and January 31, 2017. We are currently restoring, repairing or replacing approximately 100 existing signs and will be installing up to 75 new signs based on input from the public. What happened to the submission made a year ago on the OGOPOGO ISLAND viewpoint on Highway 97 just south of Peachland? Hello Terence and thank you for connecting with us here. There is an existing Stop of Interest sign about Ogopogo which we plan on refreshing, however we need to to do some stakeholder engagement and consultation before we can move forward on that. Hope that this helps! Your town sounds wonderful though – is it possible someone else might have submitted on your behalf? How about an app for your smartphone with all the historical points of interest and viewpoints etc along all the Bc highways. Great suggestion! We have shared it forward with the Stop of Interest team. Well, that is a very interesting fact! This would be a fantastic slogan for White Rock tourism advertising purposes. White Rock’s pier is the longest wooden pier in Canada. I always stop whenever I can when we see these signs! We don’t travel nearly as quickly as other people do to their destinations, but we have fun and learn lots! My kids end up enjoying travelling much more than I did when it was nonstop between points on our vacations. Awesome to hear! We hope you consider putting forward a submission for a new sign too. ny Dad passed away this year & I found his book which he dated 1986. I had no idea he had this & had marked in a coloured highlighter the ones he had seen in his life. I have taken on this book & am doing mine in a different colour to continue the tradition. Im learning alot about the province’s history & i a neat legacy for our family. Wow Phyllis – what a treasure! We hope you submit a suggestion and can add something special to your piece of the legacy. Ok these signs of interest are great and all…but I’d like to suggest an addition to them. How about placing a smartphone readable QR code to link to more information on the web about the specific spot? Probably be useful in areas where cell data is available. Just an idea is all. A great idea Ken. We will share forward on your behalf.